This family contains large bacilliform insect viruses with a circular, supercoiled, double-stranded DNA genome of 100 to 180 kb, developing inside the cell nucleus. They are embedded into protein crystals and infect various insect groups. Infections are initiated after such crystals are ingested by an insect and the protein surrounding the virus particles is dissolved inside the gut. When the virus disease develops in an insect host, two types of particles are formed. Either the membrane of an infected cell buds out (budded viruses or BVs) releasing virus particles for further spread within the insect host, or new protein crystals containing virus particles are formed inside the nucleus. These persist in the environment after the death of the insect and can infect new hosts. 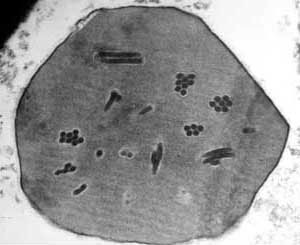 Previously, the family included 2 genera containing either viruses with protein crystals surrounding several particles (Nucleopolyhedrovirus) or a single particle (Granulovirus). Based on analysis of their DNA structures the family is now divided into four genera, some of which specifically infect certain groups of insects. Only the larval stages of the host insects become infected. This page was last modified on 23 August 2015, at 09:04.